Alex Ross's Justice is pretty transparently a love letter to the Superfriends. In fact, if they could have gotten the name rights, DC would have called it All-Star Superfriends, putting it in the same category as All-Star Superman and All-Star Batman and Robin the Boy Wonder. Except that, unlike those books, Justice actually came out. The Superfriends fought the Legion of Doom in 12 bi-monthly issues, even if the teams were never actually called that. With the fear of nuclear holocaust haunting everyone's dreams, the atmosphere is perfect for the Prince of Nightmares to play his insidious games... and play he does. Scarecrow doesn't get a lot of respect as a Batman villain. Sure, he's got the fear gas thing going for him, but the most cred he ever got was in Batman Begins, and even there his climactic fight was anything but. Show up, say something threatening, get sent packing with little or no trouble. It's like he's got his own three-step plan for failure. Based just on looks, however, Alex Ross has managed to crank up Scarecrow's creepiness factor to 11. Justice Series 6 Scarecrow actually manages to look more like the villain in a slasher flick than a costumed supervillain, which is a compliment. 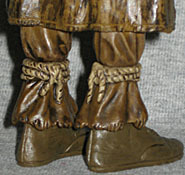 A thick overcoat is draped over his shoulders, concealing most of his body, but his lower legs reveal that he's wearing his traditional costume underneath - you can see the ropes tied around his ankles. His shoes almost look civilian, but his wide, flat-brimmed hat has rough straw poking out the top, creating an inhuman appearance. The face beneath the brim is no better. 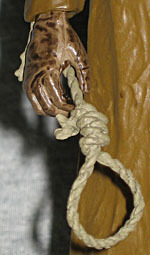 Rather than the stylized scarecrow face seen on many other figures, this is simply a brown rag pulled tight over the face beneath, like cloth wrapped around the head of a cadaver. You can make out the sunken eye sockets, the bridge of the nose, and even hints of a bare skull's teeth. It's quite unsettling. Hard to imagine there's a real human face behind there somewhere, but there is. The figure includes a second removable head, but that one's not much better. Depicting Dr. Johnathan Crane in his "everyday" form, this head does nothing to alleviate the creepiness when put on the figure. Crane is thin, with the stern yet detatched looks of a harsh headmaster. With his head on this body, Scarecrow looks like he should be leading a witch-hunt. His glasses are glued in place, so they don't have to hook over his oversized ears, and they don't have the same problem as Commissioner Gordon's. Scarecrow's mobility is somewhat restricted by his coat, but he still has a balljointed head, balljointed shoulders, hinged elbows, swivel wrists, a simple T-crotch, hinged knees, and swivel ankles. Plus, hidden away under the coat, he has a swivel waist. Yay, Scarecrow! His paint apps are fairly monotone, what with the lovely combo of brown, brown and browner, but everything is still painted well. Yes, he looks rather dull by himself, but when he's mixed in with Luthor, Cheetah and Sinestro, he stands out by not dressing head to toe in bright vibrant colors. Unsurprisingly, Scarecrow comes with one of the large display bases all the other Justice figures have. He stands well enough on his own, though. When you swap his heads, you can also remove the noose he's wearing like a tie - it's a separate piece that just lays in place - but his only real accessory is a single clear plastic test tube that can be held in his left hand. It's probably full of fear chemicals, so if you suddenly start to get real paranoid after handling it, that's why. Twice, recently, writers have tried to make Scarecrow into more of a threat. First, Judd Winick mutated him into the monstrous "Scarebeast," but thankfully that has pretty much been swept under the rug and ignored since then. Then, in Detective Comics #835, John Rozum penned a story that played up Crane's psychologist roots, and made the Scarecrow into a genuine threat that Batman struggled to contain. Alex Ross's vision of Scarecrow definitely fits with that second interpretation, and should be in the collection of anyone who likes horror figures. Is this the best Scarecrow DC has ever released? Hard to say. But it is the creepiest.